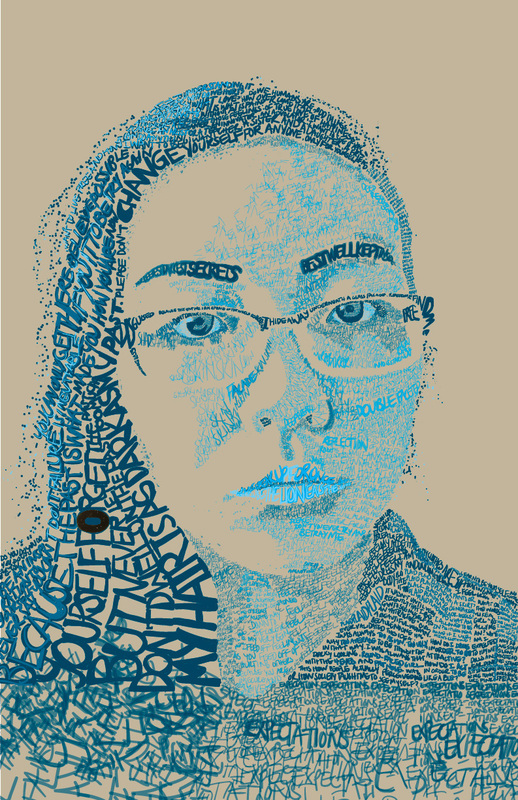 I created a self-portrait completely out of typography and letterforms, including a piece of found/material type. I wanted to explore the type and how I could utilize it in terms of scale, value, shape, hierarchy, etc. All of this was handwritten type, done on a drawing tablet. My process included 1) Using the photo reference and beginning with the exploration of value through color, 2) Establishing hierarchies through the variation of size, value, and spacing, and 3) Deciding which parts I was going to include and emphasize based on how each separate area differed from another. I thought about these elements all at once, which helped make the process easier as opposed to doing one step at a time. Value was one of my big focuses here, especially as emphasized in the face through the use of overlap and color.